If your organisation struggles to deliver projects and/or programmes successfully but are not sure why, or how to go about making improvements, then a P3M3® assessment is the best place to start. A high level assessment can be conducted within a very short timeframe, from which you will gain a measure and understanding of your organisation’s current capabilities in project, programme and portfolio management (the three Ps). 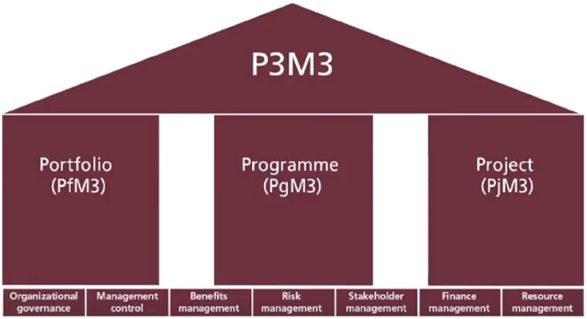 P3M3® is an acronym for ‘Project, Programme and Portfolio Management Maturity Model’ and sits alongside the Axelos best practice standards for project, programme and portfolio management (PRINCE2®, MSP® and MoP®) as the most widely recognised standard for measuring an organisation’s capabilities in these three disciplines. Each model and perspective combination is evaluated and scored from 0 to 5. Within a single day on-site with you, Adrian Shaw (accredited P3M3® assessor) will gain sufficient information to be able to present back to you, shortly afterwards, your P3M3®scores, along with a vision of ‘what good would look like’ for your organisation to achieve higher scores, and recommendations on how to bridge the gap. By implementing the recommendations, you will then gain the vital benefits of reliably and robustly selecting and delivering an optimised portfolio of projects and programmes on an ongoing basis, which will be reflected in improved P3M3® scores in the, not too distant, future. P3M3®, PRINCE2®, MSP®,MoP®, P3O®, MoR® and MoV® are registered trademarks of AXELOS Limited. All trademarks are used under the permission, and remain the property, of their respective owners and are used for identification purposes only.